This recently renovated townhouse is located close to the sea and within a short walk to the beautiful sandy beach of Cala Vadella. There is a short pathway just in front of the house which brings you right down to the sea and beach. On street level you will find a private covered parking space and a large open roof terrace with a nice chill out area. On the entrance level, we find the living/dining room with a brand new American style kitchen and guest bathroom. There is a nice wooden deck terrace offering amazing views to the beach. The lower level is for the 3 bedrooms, of which the master bedroom has an ensuite bathroom. 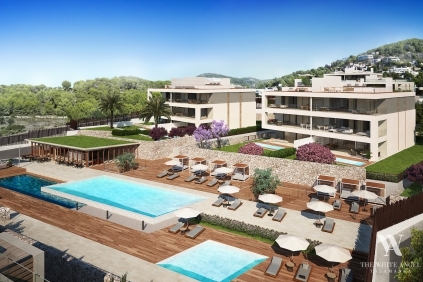 The 2 other bedrooms share a bathroom and have a direct access to the large terrace with swimming pool. From here you have an access that allows you to go straight down to the beach of Cala Vadella. Furthermore, there is air conditioning warm and cold, double glazing, a fully equipped new kitchen, and a private parking space. A nice and well maintained townhouse in an excellent location to fully enjoy the Ibiza beachlife! Several nice restaurants, the Maya Beachclub and the beach are just a short stroll away! 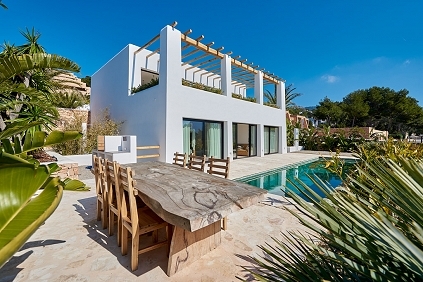 Very charming fully renovated townhouse for sale in Cala Vadella, Ibiza. There is a short pathway just in front of the house which brings you right down to the sea and beach. 3 bedrooms, several good sized terraces, private plunge pool. 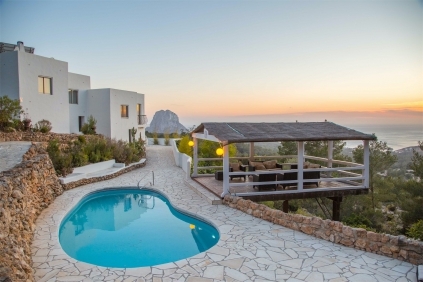 A nice and modern townhouse with stunning views and in an excellent location to fully enjoy the Ibiza beachlife! Several nice restaurants, the Maya Beachclub and the beach are just a short stroll away!